One of the sharpest rallies in oil’s history occurred in late 2010, when it surged 70% in eight months from just over US$70 per barrel to hit a high of more than US$120 per barrel. However, only three months earlier it had declined from approximately US$86 per barrel to US$71 per barrel between April and May 2010. Today, we seem to be heading towards a similar scenario. However, while the naysayers would have you walking away from oil stocks at the moment, it could pay to look back to 2010 and rethink your oil investment strategy. It is worth noting here that majors such as Woodside Petroleum (ASX:WPL), Santos (ASX:STO) and Oil Search (ASX:OSH) have bounced off their recent lows which were struck when the perfect storm of volatile equities markets and a falling oil price sent them plummeting. The fact that the majors are recovering is usually a good sign for the smaller players in the sector, and today we look at a company with outstanding assets in highly prospective areas. The company is definitely smaller by market cap, but as many analysts have pointed out, it is punching well above its weight in terms of its projects which are about to undergo much anticipated exploration. For those who want to gain some leverage to a bounce in the oil price, this could well be the stock to target. With four fully funded high impact wells expected to be drilled on two potentially company making projects over the next two years, this company is now reaping the benefits of a period where it has built up an unrisked Prospective Resource base of 1.1 billion barrels of oil equivalent (Bbble). One of the company’s projects located offshore Western Australia with a diameter of 18 kilometres has been flagged by an analyst as the largest undrilled single structure prospect in Australia, bearing geological and structural similarities to the giant Tengiz Oil Field in Kazakhstan. This company also benefits from its diversification with an independent assessment of one of its other projects identifying exploration potential of approximately 15.7 billion barrels of oil in place with a prospective (recoverable) resource of 718 million barrels (best estimate on a 100% basis). The broader region which hosts this presents a highly prospective yet under-drilled opportunity. Referred to as Block 9 and located in Cuba, it is along trend from and over similar structures to the major Cuban producing areas. This includes the 11 Bbbl Varadero Oil Field, and areas currently operated by TSX-listed Sherritt International, the only other western player in Cuba. An endorsement of this project’s high prospectivity is the fact that it has attracted major global players who are providing infrastructure, expertise and funding for the 2019 drilling campaign. 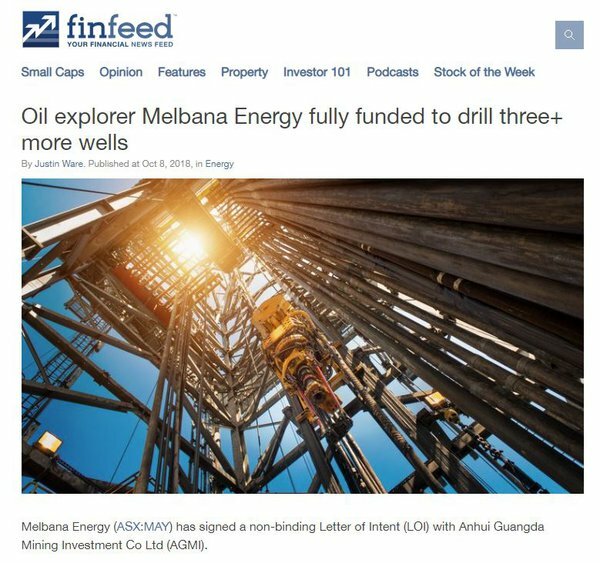 Melbana Energy (ASX:MAY) has two highly prospective projects in Cuba with the company advancing preparations for drilling two wells in Block 9, while progressing its assessment and seeking to finalise a long-term agreement for the Santa Cruz Incremental Oil Recovery opportunity. Its Block 9 Cuba oil play is the main game for MAY, particularly over the next 12 months where an extensive exploration campaign could result in a substantial increase in its resources which would drive up its asset valuation and in turn potentially its share price. The graphic below explains why Cuba could be so lucrative for the company. The Cuban region is an anomaly in its own right, being host to the 11 Bbbl Varadero Oil Field and other producing areas, yet is one of the most underexplored oil bearing regions. This may not be the case for too much longer with multinational energy companies not only targeting the area, but more specifically teaming up with MAY in agreements that are highly beneficial to the group, essentially an endorsement of what the big players perceive as a highly prospective target. As the only ASX-listed oil and gas group with exploration acreage in Cuba, and one of the few exploration companies in the world with a footprint in Cuba, MAY is in a unique position in the global oil and gas industry. The Block 9 Production Sharing Contract (PSC) area is in a proven hydrocarbon system with multiple discoveries within close proximity, including the Motembo field – the first oil field discovered in Cuba. MAY has identified Block 9 as one of the world’s most exciting exploration plays with an independent assessment by McDaniel & Associates highlighting exploration potential of approximately 15.7 billion barrels of Oil-in-Place with a Prospective (Recoverable) Resource of 718 million barrels (Best Estimate, 100% basis). 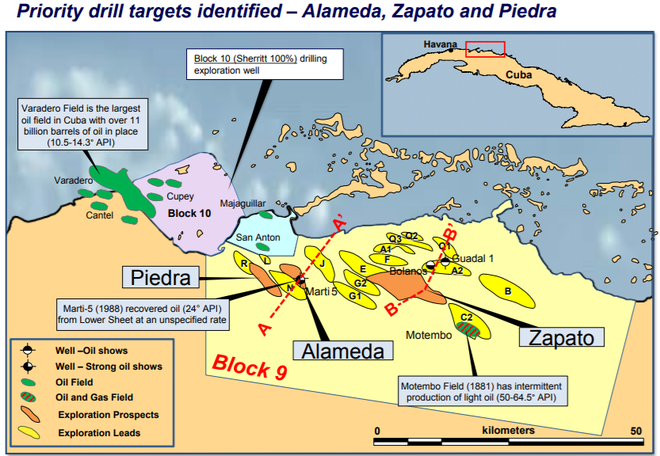 MAY’s two highest rated Cuban prospects, Alameda and Zapato, provide an opportunity to test four targets with potential for approximately 15.7 billion barrels Oil in Place and an estimated 236 million barrels recoverable. The company’s aim is to drill up to two wells in Block 9 during the current exploration sub-period which concludes on November 3, 2019. The first of these will be Alameda-1 which is planned for April 2019. All key regulatory approvals for this well have been received, and it will be testing 141 million barrels of recoverable oil on a best estimate basis. The Alameda Prospect is currently the highest ranked exploration target in Block 9. Alameda is a large structure located in the western part of Block 9 and is in a similar structural position to the Varadero field only 35 kilometres away. The proposed Alameda-1 well will test a combined exploration potential of over 2.5 billion barrels Oil-in-Place, as well as 140 million barrels of recoverable oil on a 100% unrisked, best estimate basis and 279 million recoverable barrels aggregate high side potential. While characterised as an exploration well, the chance of success at Alameda-1 benefits from two old wells, both of which recovered oil. The primary objective at Alameda ranges in depth from approximately 3000 metres to 3700 metres. The presence of oil in the Alameda structure is supported by the Marti-5 well drilled within the prospect closure in a down flank position nearly 30 years ago. This recovered 24° API oil and had numerous oil shows extending over an 850 metre gross interval from the Lower Sheet section as indicated below. Alameda-1 is estimated to take approximately 80 days to drill, and in the event of a discovery there would be significant follow up potential, with a number of additional leads in close proximity. The proposed Zapato-1 well location is in the central portion of Block 9 and is designed to test a Lower Sheet closure in close proximity to the shallower Motembo oil field which has historically produced high quality light oil. The Zapato feature has a crest at approximately 2,000 metres and is a robust structure with nearly 1,000 metres of vertical relief. Block 9 has premium quality detailed pre-existing gravity and magnetic data sets. In the type of geology present in Cuba it is common to use a combination of seismic, magnetic and gravity data sets to define prospectivity. A recently completed gravity and magnetic study commissioned by MAY and undertaken by Cuba’s specialist technical laboratory CEINPET over the Zapato prospect has indicated a strong gravity and magnetic alignment with the structural interpretation MAY derived from seismic and surface data. This result is supportive of MAY’s assessment of the prospectivity of Zapato as a large carbonate duplex structure along strike from the Motembo discovery which produced light high quality API oil. Carbonate duplex structures such as Zapato are being targeted by MAY due to their potential to contain Varadero style oil accumulations and are able to be identified using this technique by their combined gravity and magnetic response which differentiates them from low prospectivity intervals. MAY has recently negotiated a Letter of Intent with Anhui Guangda Mining Investment Co Ltd (AGMI) with a farm-out agreement expected to be executed in December, just a few weeks from now. Importantly, this will leave the company with a free carried interest in all Block 9 activities for the duration of the permit, but it is also a strong endorsement of the high prospectivity of the target given AGMI has assets of more than US$1 billion, including 20 onshore drilling rigs and daily oil production of 6000 barrels. The group also has business relationships with major state-owned Chinese companies such as CNPC, Sinopec, and CNOOC. The terms of the farm-out are that AGMI will replace the existing bank guarantees releasing US$2.275 million of cash to Melbana and, at zero cost to Melbana, drill the company’s three best targets, testing a best estimate of 270 million barrels of oil. It will provide the company with 12.5% of the profit oil in the event of success. AGMI will also fully carry MAY for all the appraisal and development costs in the block with MAY entitled to recover its back costs of approximately US$3.5 million from any future oil production. In addition to the two key projects, MAY has significant upside in the Santa Cruz incremental oil recovery opportunity in Cuba, with execution of the agreement with Cuba Petróleo Union (CUPET, the national oil company) also expected in December. Santa Cruz is in the northern foldbelt of Cuba – the trend that is responsible for the vast majority of Cuba’s oil and gas production. Recently, MAY completed its initial technical assessment of the opportunity with sufficient encouragement to support the company proceeding to the next stage of negotiating a long term binding agreement. The Santa Cruz oil field was discovered in 2004 when drilled via a land based rig with a deviated well out to the offshore structure. It initially tested at 1250 barrels per day with varying oil quality, typical of most Cuban oil production. Initial estimates reported that Santa Cruz had up to 100 million barrels of recoverable oil with appraisal drilling confirming a field area of greater than 20 square kilometres and a significant oil column of 250 metres. Santa Cruz was declared commercial in 2006 and produced in excess of 1 million barrels in the first year. By 2012, production was approximately 1600 barrels per day and the field had produced 7.4 million barrels from 18 wells. Under an Incremental Oil Recovery (IOR) contract, additional production above an agreed base production rate is shared under the terms of the contract as shown below. 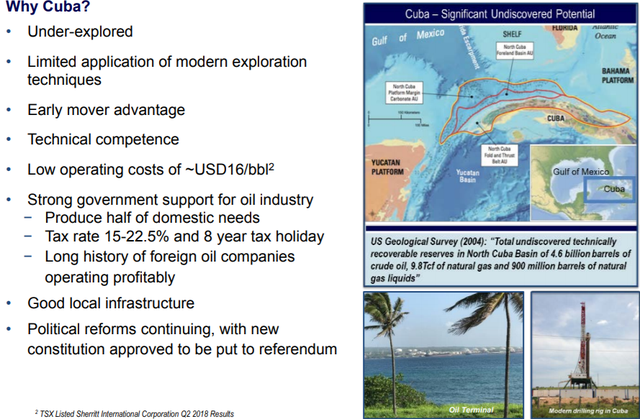 Given finalisation of commercial negotiations with Cuba’s national oil company on the final definitive terms for the long term Santa Cruz (IOR) contract is expected by year-end this could be an imminent share price catalyst. 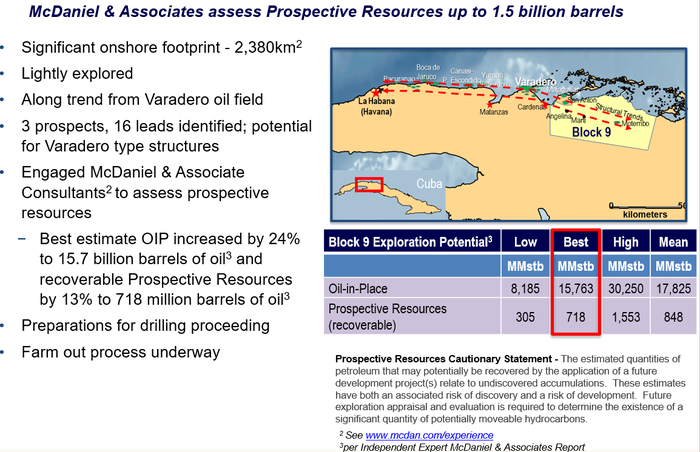 Looking across all of the Cuban assets, Independent Investment Research oil and gas analyst Mark Gordon has attributed a risked valuation of 3.3 cents per share, although broker projections are speculative and may not come to fruition. During the September quarter a 3D seismic survey was completed at the WA-488-P Beehive prospect located offshore Western Australia, which also included an extension over the Egret lead. This was fully funded by Santos and Total, and provided coverage over the portion of Egret that is partially within the boundary of WA-488-P.
Santos and Total have an option (exercisable together or individually) to acquire a direct 80% participating interest in the permit in return for continuing to fully fund the costs of all activities until completion of the first well. The option is exercisable by either Total or Santos at any time but no later than 6 months from the receipt of processed seismic survey data. If the option is exercised, drilling would be expected to be no later than 2020 with MAY estimating that the Beehive-1 exploration well cost is indicatively in a range between US$40 million and US$60 million. 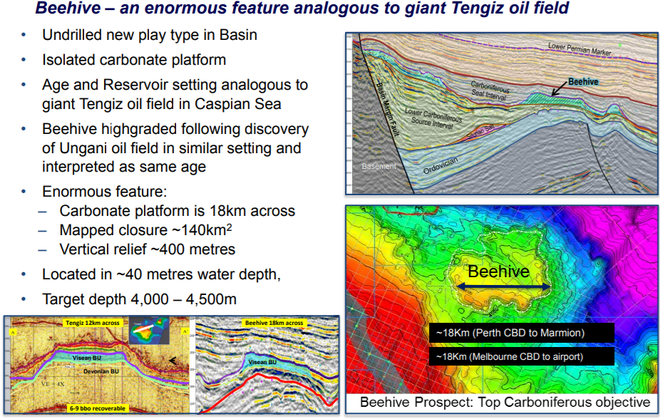 Santos recently highlighted the Beehive Prospect at the company’s annual Strategy Day, describing it as a Multi-TCF gas / large light oil prospect in a new play, with a forward plan to ‘mature inventory from Bethany, Beehive 3Ds to build on 2020 drill options’. In recent weeks, at its first opportunity to review early data products from the Beehive 3D Seismic Survey, management said that it is of excellent quality for this stage in the processing exercise. A final data set should be to hand by early February, another potential share price catalyst. While most of the near term focus is on Block 9 Cuba, given Beehive is potentially the largest undrilled oil prospect offshore Australia there is clearly a possibility that it may be a game changer. Indeed, analysts are well aware of the value that could be added as the company embarks on its 2019 drilling campaign. Gordon has attributed a risked valuation of 2.1 cents per share to the Beehive asset, roughly 35% of the total valuation of 5.9 cents. Consequently, the Beehive asset alone is valued at a 50% premium to the company’s recent trading range. Gordon’s total valuation of MAY is 5.9 cents implying a premium of approximately 300% to the company’s recent trading range, but again this is speculative and may not eventuate. Beehive is thus a major part of MAY’s asset portfolio. Should any of the numerous catalysts come to fruition over the next 12 months, they could form the basis for a significant share price rerating for MAY. There is certainly plenty of news to come. Recent newsflow began with the signed Letter of Intent for Cuba Block 9 farm-out and will continue with the Sherritt Cuba Block 10 drilling result, Santa Cruz binding agreement, Total and Santos option to drill Beehive and the next big piece of news: the signed long-term binding agreement for Block 9. Then there’s drilling of two wells in Block 9 to follow in 2019. There’s plenty in the pipeline for MAY, so it would be one to watch over the silly season, with an investment in MAY potentially not so silly.